Hi loves! Another Saturday, another Dance Legend swatch post. Next week will be the last week for now, and I am making them count for sure! That's why today I have 3 stunning multichrome shades for you from the Galaxy collection. These beauties come in the same minibottles like the Holodays shades and Chameleon shades. The Galaxy collection consists of 8 shades, 2 being limited edition. They're all multichromes with large chunky holographic flecks added. 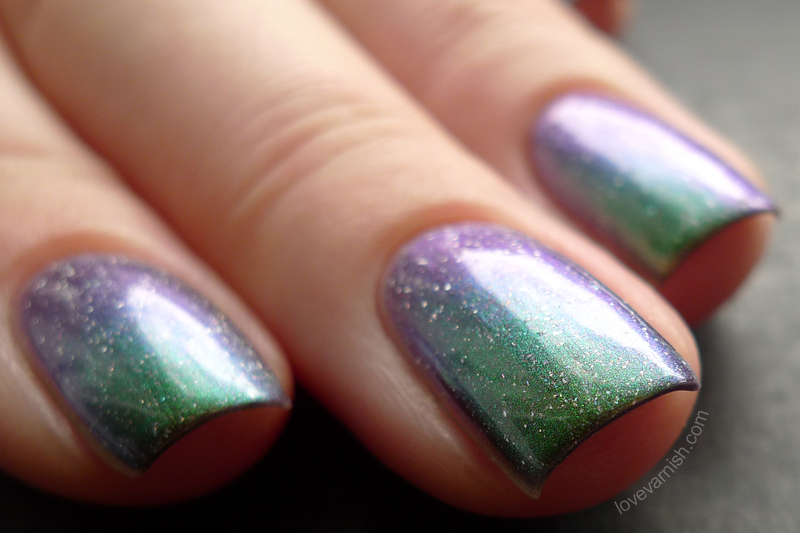 The 2 LE shades are an exception, these have flakies instead of holographic flecks. While the colorshift is superstrong in the polishes I tried, the holographic sparkle doesn't show up without very bright and direct lighting. Without that, it's just pretty silver flecks which doesn't disappoint me because it still looks pretty, but it might not be what you want out of these. The formula was the same on all 3. It's sheer at first but builds up nicely in 3 thin coats. The first one you just have to lay down as it goes, don't fiddle too much or you'll have bald patches. You can make it looks nice and even with your second and third coat. They dry quite flat so I added a layer of topcoat. Normally I have a quite steady blogpost with pictures in the same poses, this time my pictures didn't really cooperate so enjoy some diversity ;-). Dance Legend Big Bang has warm tones to it. You can see red, copper, green and everything in between. It looks like Dance Legend Boo with the holographic sparkle added. 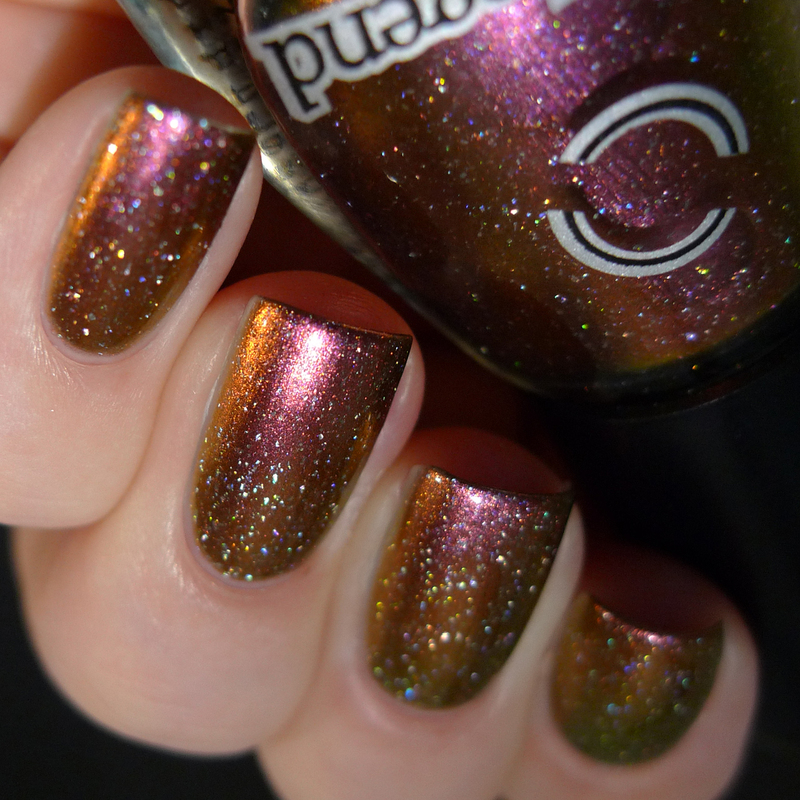 Dance Legend Pulsar is the "traditional" purple, red, blue multichrome with again warm tones to it. It looks like Dance Legend Celia with the holographic sparkle added. 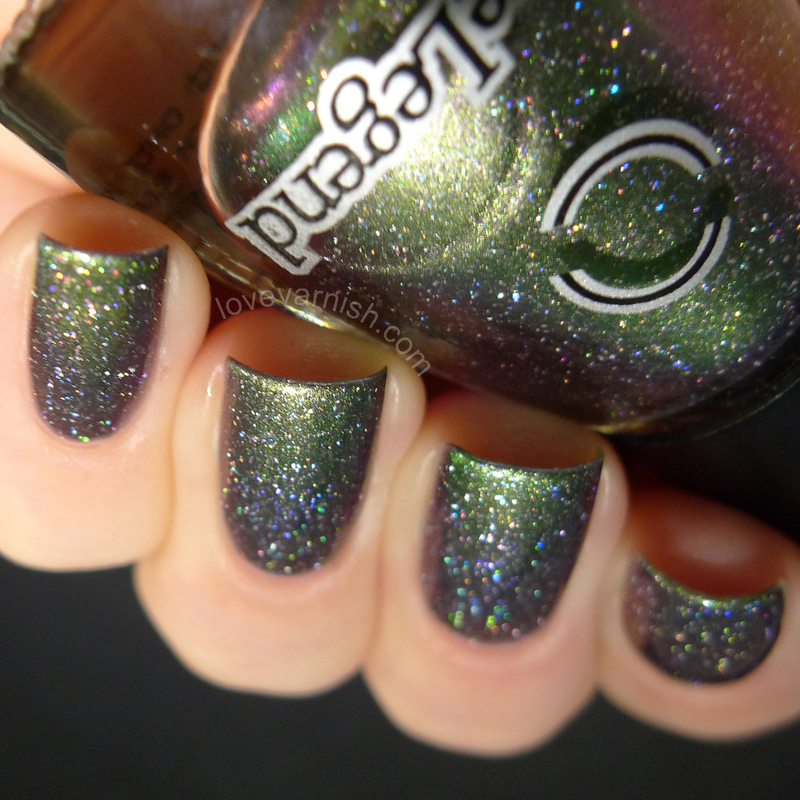 Dance Legend Solar Eclipse is more cool toned and has brown, grey and green colors to it. I don't see any resemblance with Chameleon shades here. That's it, my 3 picks from the Dance Legend Galaxy collection! Which shade do you like best? My pick would be Big Bang. Tell me yours in the comments! Dance Legend is sold through their own webshop. Dance Legend Galaxy shades come in 6,5 ml. bottles and retail for $8. Shipping worldwide is $10 and free if you order over 10 bottles. 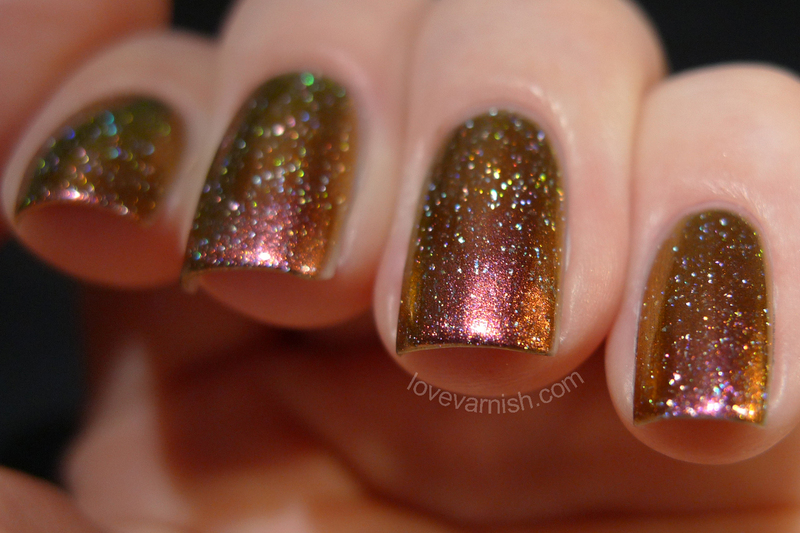 Solar Eclipse does not have a "sister" in duochrome collection, indeed, but it is very very close to Bag of Bones from Anna Gorelova by Dance Legend collection. I have Phobos on the way to me. At least I hope so. I ordered from their website a week ago and still haven't gotten any shipping notification. It is also nice to know that this collection comes in smaller bottles. They really should state that on their website! Wow, these are amazing! Can't go wrong with duo chrome AND holo!